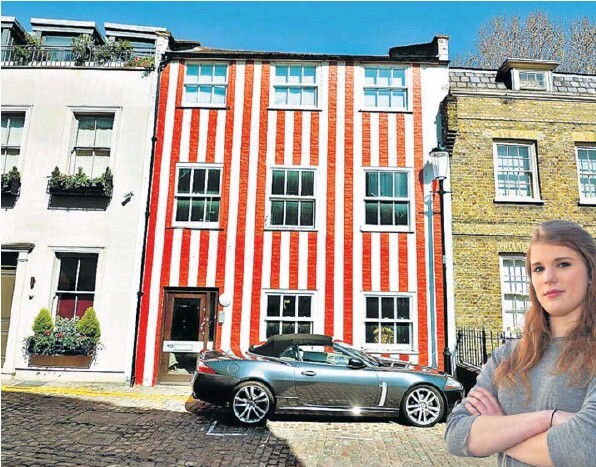 The owner of a £15 million house in Kensington, west London, has been accused of painting it in stripes out of spite. Zipporah Lisle Mainwaring’s plans to rebuild the property have been opposed by neighbours, who believe that she is out for revenge. “This whole road has been united in its hatred of that house,” Saskia Moyle, 18, left, who lives opposite, said. Anyone frustrated with telemarketers may have a new best friend. A Los Angeles man with an unusual passion for phone systems created a new robotic answering service that wastes telemarketers’ time. Anderson experimented with different personalities for his robot before deciding that an odd man who just woke up from a nap worked best. For instance, the robot burned time by telling the telemarketer they sound like a former high school classmate, rambling on about needing coffee or asking them to start over again. To create the system, Anderson recording himself saying a variety of lines, which the system chooses based on the situation. The system is programmed to be agreeable until it senses suspicion in the telemarketer, because of silence, vocal inflection and volume. Then it will say something inane and ask for the pitch to be restarted. The service, which can juggle multiple calls at once, has had some success. In the past 10 days, the number (214-666-4321) has received 100,000 calls. Anderson has been praised online. Media outlets in Australia, South Africa, Britain and beyond have reached out to him. Anderson has loved phone systems since 1991, when he met the ROLM telephone system as a young engineer at Sears. Since then, he has devoted his life to telecommunications. Today the consultant maintains the phone systems that large companies use. As his creation went viral this month, Anderson launched a Kickstarter campaign. He wants to build robots with a variety of voices and languages. The robot currently uses only one voice: Anderson’s. He dreams of ultimately going even bigger and toppling the global network of call centers. In his perfect scenario, telemarketing would become inefficient, making the call center business model collapse.